☕️ Good Saturday morning from Oshvegas, a.k.a. Oshburg ... Oshkosh, Wis. 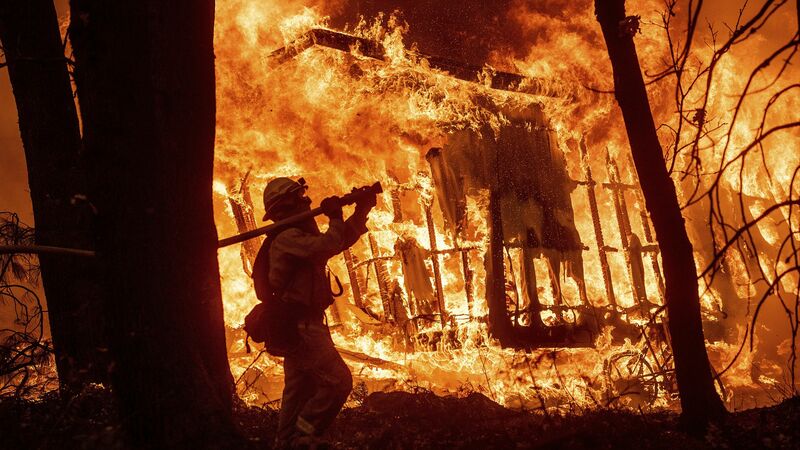 In three increasingly strident reports — two in the past two months — scientists reach the dire, unified conclusion that global warming is already costing lives and inflicting a mounting economic toll, Axios science editor Andrew Freedman writes. How it's playing ... N.Y. Times 2-column lead, "U.S. CLIMATE STUDY HAS GRIM WARNING OF ECONOMIC RISKS: Reduction of Up to 10 Percent in G.D.P. — Findings Are at Odds With Policies." "For most tech stocks, it has been downhill ever since. Now the talk is about a trillion-dollar meltdown. 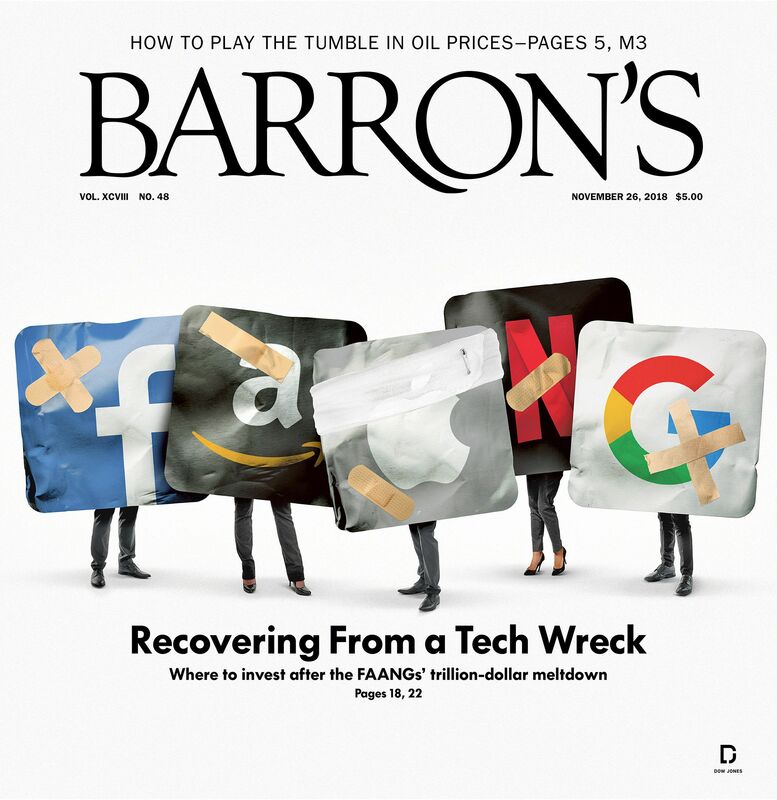 The FAANGs — a basket of high-growth technology companies that includes Facebook, Amazon, Apple, Netflix, and Alphabet — have lost $1.1 trillion since their peaks." "This month alone, the loss comes to $400 billion. Each of the FAANGs has sustained drops ranging from 20% to 40%. Among the list of top 10 S&P 500 tech stocks in 2018, Netflix is now the only FAANG to make the cut." "For investors, the selloff is also a chance to step back from the FAANG obsession that has dominated investing since the acronym became popular in 2015. (The original incarnation of FANG didn’t include Apple.)" "While the group of stocks has seemingly moved together since then, the FAANG stocks topped out at different times this summer, speaking to their varied business models." The Frost Moon, a full moon named by Native American tradition, rose yesterday behind the Empire State Building, as seen from Newark. Predictim, an online service that uses artificial intelligence to assess a babysitter’s personality, scans a candidates' Facebook, Twitter and Instagram post to offer an automated "risk rating" for drug abuse, bullying, harassment, being disrespectful or having a bad attitude," the WashPost's Drew Harwell writes. Dozens of firms are selling employers "systems that analyze a person’s speech, facial expressions and online history." The FAA "is significantly behind earlier schedules for crafting airborne-identification rules for drones, causing industry officials to worry the delay could stymie their most ambitious plans for years," the Wall Street Journal's Andy Pasztor reports (subscription). Why it matters: Some experts believe regulations aren't likely to come until 2022. "Many agree drones need electronic license plates [for reliable remote tracking]; few agree on how they should work." The state of play: The FAA could propose standard regulations this month allowing small drones to fly over crowds and populated areas, per the WSJ. But other regulations will take years to iron out. Go deeper: Drone sales exploded in 2017, surpassing the $1 billion mark for the first time. "Target, Kohl's and other retailers are pushing 'cozy' goods. That means pajamas for the family, weighted blankets, fuzzy mules and everything Sherpa — from socks to sweatshirts. ... Kohl's is making it easy to choose soft and snuggly fashions by prominently displaying the looks near store entrances." Gross sells in the toy business: "In one game, called Don't Step In It, players are blindfolded and have to avoid stepping in soft, clay-like 'poop.' A unicorn version of the game features poop in bright colors. Both have been on Amazon's list of bestselling toys. Another popular game is Pimple Pete ... Players pull, wiggle or twist out squishy 'zits' from a plastic face. Losers get squirted with water." "The LOL Surprise brand is a hot seller again so far this year ... [K]ids peel each layer of a shrink-wrapped plastic ball to reveal dolls, stickers or other trinkets." Store trends ... "Walmart ... recently introduced WalmartToyLab.com, a new digital playground where shoppers can play with 20 top toys on their computer or tablet. They can also share their favorites on a digital wish list. At the store, Walmart's app now helps shoppers find the exact location of a particular item." "Amazon and eBay are taking a page from traditional retailers and printing their own toy catalogs. Amazon is shipping its toy book to shoppers' mailboxes while eBay placed a shortened six-page version inside People magazine's 'Sexiest Man Alive' issue." "One thing missing from Amazon's toy book: prices. The online retailer tells readers to pick up a phone, open the Amazon app and take a snap of the toy to see how much it costs. Both companies are trying to make a play for former shoppers of Toys R Us."